I feel like I am the last person to offer a riff on s’mores. Are cupcakes even still trendy? No matter, I’m sharing s’mores cupcakes with y’all today because they are delicious—sticky, but very delicious. These soft chocolate cupcakes have chunks of graham crackers scattered throughout and brûléed marshmallow fluff that oozes down your fingers. I feel like an 8-year old Girl Scout all over again when I eat them. I especially love these cupcakes because you can match your s’more campfire marshmallow-toasting style to these cupcakes: if you’re one of those that likes your marshmallow to catch on fire in the campfire before eating it, that can be accomplished here (although be careful). If you like only a slightly toasted marshmallow, use a light hand with the brûlée torch. The middle cupcake was lightly toasted by holding the flame about 3” from the marshmallow fluff and moving it constantly—keeping the flame in an area too long leads to black spots! Enjoy y’all! Preheat the oven to 350°. Line 4 cups of a muffin tin with paper liners. In another bowl, whisk together the canola oil, vanilla and brown sugar. Add the dry ingredients to the oil and brown sugar mixture in two batches, alternating with the milk mixture. Finally, stir in the graham cracker chunks. Divide the batter between the 4 muffin cups and bake for 16-18 minutes, or until a toothpick inserted comes out clean. Let cool completely before topping with marshmallow fluff and brûléeing with a kitchen torch to your desired level of doneness. See notes in header about brûlée technique. Serve immediately—they do not store well after marshmallow fluff is toasted. *Tip: To use up the rest of the jar of marshmallow fluff, try my Fantasy Fudge from last Christmas. Cupcakes are always in fashion at my house ; ) And stickky s’mores cupcakes, even bettah! These look wonderful and your photo is fantastic! I say that s’mores and cupcakes will always be trendy. These look perfect for a summer night! Yes please! I would love about 3 of these right now! Four cupcakes? I would need to double this…yes, even just for my husband and me. You can never have too many s’mores cupcakes. Love this!! There is nothing better than a messy ooey gooey mallowy s’mores cupcake. Gah, brilliant!! 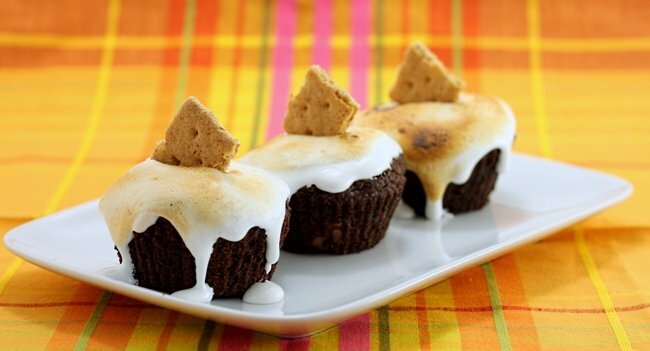 These look delicious – S’Mores are my favorite! Please…these look too good to pass up! Now all we need is a bonfire and we are set! P.S..Yes I would LOVE some help in the slug department! Drop me an email when you get a chance! Um WOW! I don’t care if cupcakes are or are not trendy right now, I would eat this any time, any place :) Like right now, perhaps? Absolutely beautiful! Cupcakes are still trendy for girls/women. Cupcakes are probably not a guy, I don’t make cupcakes, but I do enjoy eating them. Looks so good and perfect! That toasted marshmallow looks SO yummmmmmmy!!!!! I love the toasty taste … actually, I even like them burnt! The marshmallow topping is fabulous. I could eat at least 3 of these right now! I personally believe that cupcakes will never go out of style. These look delicious, and who doesn’t love an excuse to break out the kitchen torch! Well honey, I haven’t done s’mores anything on my site, so you’re certainly ahead of me. They’re just adorable! I’m totally a “catch the marshmallow on fire and let it burn!” sorta girl. How about you? I don’t think you can have enough s’mores recipes, especially with summer approaching. And yours look so gooey delicious! I love the drippy topping, the visual appeal is very tempting!! Those cupcakes look so delectable and tempting! This looks just decedent! I love the presentation of these too.! Um…I’m kind of wanting to lick my screen now. YUM! Looks fantastic, you have me drooling! Thats all I’ve got to say about that…. These look delicious, I love the toasted marshmallow topping!